THE CASTLE COMBE COLLECTION OF ENGINEERED FLOORING HAS A VERY DISTINCT LOOK THAT WILL MAKE ANY HOME OR BUSINESS UNIQUE. Our mission is to provide superior products at an affordable price while making customer service our top priority. 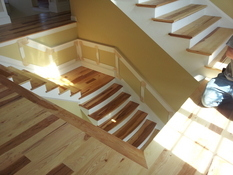 Virginia Hardwood Floors LLC began in 1919 as a Hardwood Flooring Manufacturer and Supplier. As the years progressed we have developed relationships with many reliable vendors. We have since evolved into a Full Line Distributor for the Flooring Trades Industry in Virginia, West Virginia, Maryland, Washington D.C. and Pennsylvania. In 2009 we became Virginia Hardwood Floors LLC. We have placed our focus on distributing quality Northern Appalachian Hardwoods, Engineered Flooring, Cork Flooring and Flooring Supplies. Installation of 5" Character Grade Hickory.